Employment website Monster.com launched a TV ad, Daybreak, on January 1, part of the “Your Calling is Calling” campaign. Residents of a city attempt to delay the arrival of Monday morning. The concept? You can’t stop the arrival of the working week. So make sure you’re spending your week fulfilling your calling. 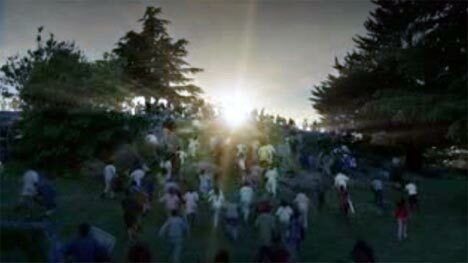 Shortly before dawn men and women, boys and girls, grab mattresses, satellite dishes, chests and cardboard boxes, trash can covers, wall boards and other flat objects and head to the hills to do battle with the sun. As the sun comes over the horizon the weekenders attempt to repel its rays, but to no avail. They wander back to their homes, preparing to face another week at work. The Monster response? “Don’t Fight Monday”. Daybreak was developed at BBDO New York by chief creative officer David Lubars, executive creative director Eric Silver, art director Chuck Tso, copywriter Adam Kanzer, senior producers Anthony Curti and Ed Zazzera and executive music producer Loren Parkins. Filming was directed by Nicolai Fuglsig via MJZ, Los Angeles, with director of photography Benoit DelHomme and producer Anna Hashmi. Editorial work was done by editor Rick Russell at Final Cut, with executive producer Rana Martin and producer Laura Lamb Patterson. Visual effects were developed at The Mill, New York, by Lead Flame Angus Kneale, VFX Supervisor Corey Brown, producer Jo Arghiris, colorist Fergus McCall. Sound and music was put together at Cherry Tate Music by sound designer Terressa Tate and composer/violinist Rebecca Cherry, their first collaboration. Hear the Daybreak track again on Rebecca Cherry’s MySpace site and Cherry Tate Music Production’s MySpace site.